Intending pilgrims from the Federal Capital Territory (FCT) have been urged to be good ambassadors of Nigeria while in the holy land of Saudi Arabia. 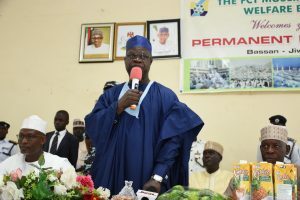 FCT Minister, Malam Muhammad Musa Bello gave this charge while addressing participants of this year’s Hajj exercise from the FCT during last week’s (yesterday’s) farewell ceremony, marking their departure for the annual religious exercise. Tasking them to pray for the peace, progress and security of Nigeria, including President Muhammadu Buhari while in the holy land, Malam bello urged: “you are ambassadors of the FCT in particular, and Nigeria, at large. I therefore urge you stay away from all acts that will tarnish the image of our country Nigeria. 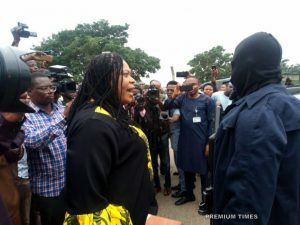 “Do not forget that we will monitor you and we will not hesitate to sanction anyone found wanting. As you go to the holiest cities in the world, Mecca and Medina, take this assignment as an assignment from Allah. Director, FCTPWB, Malam Muhammad Bashir who spoke earlier explained that the board recorded a hitch-free preparation due to early release of funds by the FCT Administration, which enable it to carry out necessary requirements by Saudi Arabia. Some of which, according to him, include comprehensive education and orientation, thorough medical screening and immunization of the intending pilgrims. 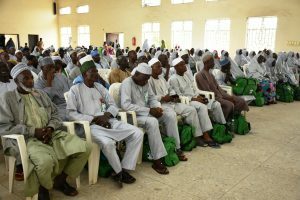 Malam Bashir also revealed that despite low turnout of intending pilgrims for this year’s exercise, the board was able to register no fewer than 1500 intending pilgrims, representing 70 percent, out of the 2115 allocated to the FCT by the National Hajj Commission.